The beautiful Indonesian island of Bali is nothing less than a paradise. It is serene and simple. The beaches are exotic and tasteful. Bali’s culture and scenic beauty are two out of million spectacular aspects of it. 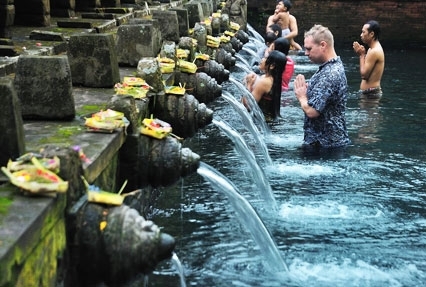 Bali is often addressed as Land of Gods, as here glimpses of spiritualism add a touch of serenity. This is a preferred destination for the lovers of adventure too. Surfing, skiing, parasailing, snorkeling, scuba diving and indeed a vast variety of options are available for adventure-seekers. Shopping scenario of Bali is impeccable too, especially because of its art and craft. Adventure-sports such as surfing, skiing, parasailing, snorkeling, scuba diving etc. in the emerald beaches of Bali. Enjoy Bali’s traditional dance, Kecak performance. Arrive Bali, Also known as the paradise on Earth. Meet and greet by our representative and transfer to your hotel. The Beautiful architecture combined with the traditional culture at the New Balinese airport is a standing example of Modernization and simplicity. Once out of the airport, you will see the magnificent statue of a Battle scene between Gatotkacha and Karna. Built in 1993, apart from being a landscaping project around the airport, is also believed to lend spiritual protection and safety for all incoming and outgoing, flights. This statue offers an excellent photo opportunity for those arriving or leaving Bali. Arrive at your hotel for check-in. Overnight stay. Start the day with breakfast at hotel. Later, leave for a full day excursion to the Kintamani Volcano. Experience up-close the quintessence of Bali, a complete delight for the first-time visitors to the beautiful Indonesian island. The first stop of the day is, Batuan village which is famous for traditional batik and hand weavings. 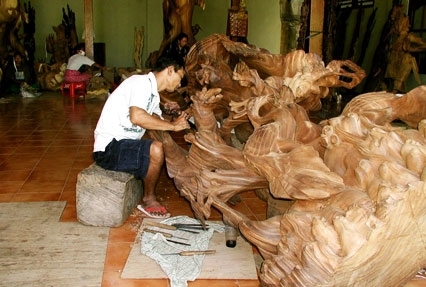 Next, stop at the Mas village, well-known for wood carvings. With a stop at the Celuk village, marvel at the fine skills of famous for silver and gold works. Proceed to one of the most ancient Hindu temples in Bali. 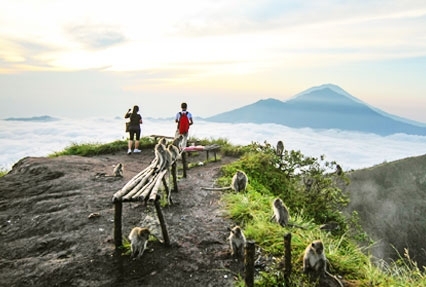 Proceed with the tour to Mount Batur and Lake Batur in Kintamani village. Enjoy the stunning views of the beautiful locales in this region. Last stop of the day is the famous Ubud market, where you can take a look around for the various shopping options to satisfy your shopping taste buds. Attend a performance of Barong Dance, which is an optional show during Kintamani tour. The popular Balinese Barong Dance is a spectacular event with a performance that lasts for about an hour presenting the endless metaphysical battle between good and evil. Overnight stay at the hotel. On this day proceed to Tanjung Benoa first. Here you are free to indulge in various marine adventures like jet-ski, rolling donut, snorkeling, parasailing, scuba diving and what not! Located in southern Bali overlooking the vastness of Indian Ocean, Tanjung Benoa has gained much importance as a tourist destination over the years. In the afternoon, have your lunch and head to Blue Point Beach, which is followed by a sunset view from the Cliff near Uluwatu Temple. You may also choose to witness Kecak Dance Performance, folk dance of Bali. Blue Point Beach stands up to its name as emerald waves gambol and gentle breeze caress its visitors. This exotic spot rather seems to be a hidden gem because it is free from all the hustle and bustle and blessed with sheer tranquility. This seashore, along with white sands is adorned with rugged jutting rocks and cliffs. The cliff near Uluwatu Temple enables the visitors to enjoy a breathtaking view of the Indian Ocean, which gets even better as the sun unfurls its golden tinge in the sky and the ocean glistens in the celebration. Uluwatu Temple is a Hindu Temple and also one amongst the six big temple groups of Bali, known as Sad Kahyangan Temple. Return to the room in the evening and stay overnight. After breakfast, you are free for your own leisure. Spend your time exploring the surroundings or choose to simply relax. Bali’s beaches are the best way to rejuvenate yourself; be it sunbathing or adventure activities, you have a lot to choose from. Overnight stay in hotel. After breakfast, enjoy your final day in Bali. Later, pack your bags and check out of your hotel, as you will be picked up from the hotel at the time of departure for your transfer to airport. 04 nights’ accommodation of your choice including breakfast. All transfers in / out from airport. 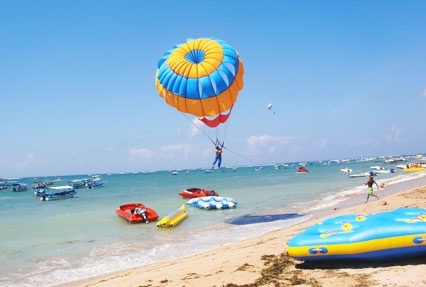 Water sport package at Tanjung Benoa beach (01 x Fly Fishing, Banana boat and Jet sky, along with Uluwatu temple and sunset tour. All tours and transfers on private basis (PVT). English speaking guide assistance on tour. 1 GSM prepaid card upon arrival per family. Guaranteed early check in / late checkout charges. (Standard check in 1400hrs and Check out 1200 Hrs). All taxes, sightseeing’s, airfare etc. are as on date. Any future hike will be charged extra. We shall proceed with your booking once we have received the payment from you & if we are not able get the original hotels, shall provide equivalent/ alternative hotels. The rate of USD calculated @ INR 70.All rates are subject to a revision - if there is a fluctuation in the currency rates. Rates are valid till 30th Sep 2019, except on blackout dates. Surcharges may apply during fairs and festivals etc.